Travel An Aircraft With A Glass-bottom Floor And En-suite Bedrooms? An Aircraft With A Glass-bottom Floor And En-suite Bedrooms? British manufacturer Hybrid Air Vehicles released conceptual renderings for the interior of its Airlander 10 aircraft, a curious, blimp-like vessel that combines the technologies of fixed-wing aircrafts and helicopters. The result is a hybrid helium airship that can stay airborne for five days at a time. Designed with affluent, luxury travelers in mind, the Airlander will feature private apartments with full-sized beds, an in-flight bar and lounge area, and fine dining catering for three-day expeditions that can accommodate up to 19 passengers. 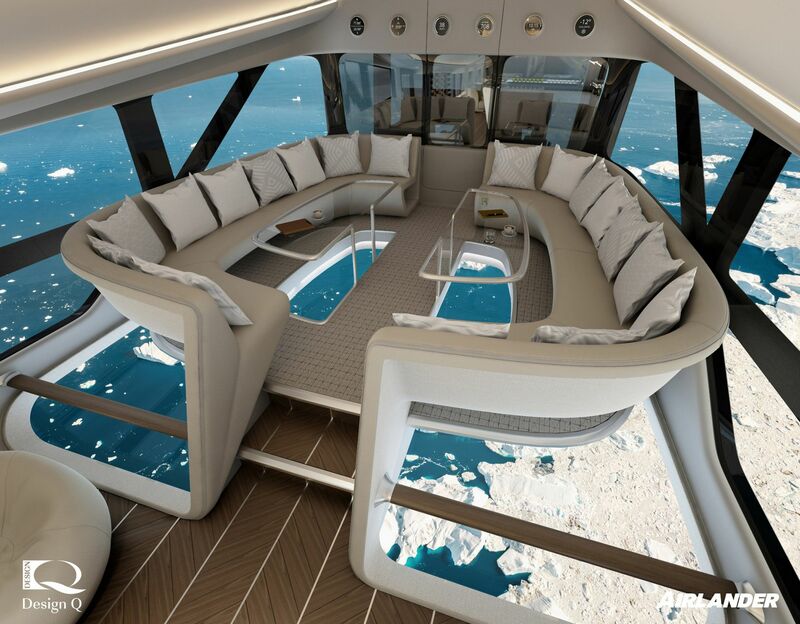 The aircraft is not designed, however, for flyers with vertigo, as the show-stopping feature is a glass-bottom floor that will offer guests dizzying views of the earth below their feet at the aptly named Infinity Lounge. Likewise, ‘floor-to-ceiling' windows stretch along the length of the cabin for sweeping views of sky and clouds. Interestingly, while renderings for the Airlander call for extended glass windows, just last month Emirates unveiled a new First Class suite featuring virtual windows in which fiber-optic cameras livestreamed images from outside the plane -- a move aimed at making the aircraft lighter and faster. The vision of aviation design consultancy Design Q, the Airlander interior is inspired by luxury yachts. At 46 m long, the cabin is also larger than most single-aisle aircrafts.